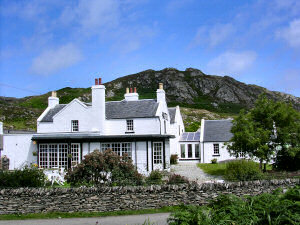 As Colonsay is not very big it is the only hotel on the island (there are also a few B&Bs and self catering cottages). It also has the only bar/pub on the island, making it an important social centre. And finally it is one of the few places on Colonsay where you go for something to eat. The hotel closed in December 2004, but luckily reopened in summer 2005 under new ownership. It has received various rewards and recently a good review in the Scotland on Sunday newspaper. Not having stayed in the hotel since it has reopened I can't really comment on how it is now, but during the visit in 2004 we had a very nice stay. The room we had was very nice, well equipped and recently refurbished (unfortunately no sea view though). From the restaurant the view goes out to the sea, having breakfast looking out to the Paps of Jura over a sea glistening in the morning sun was very nice. Should I stay on Colonsay for a few days again I'll probably stay at the Colonsay Hotel.